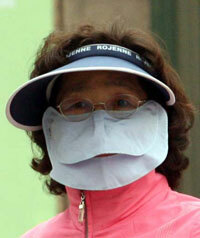 A woman is wearing a huge mask and cap in this file photo. Overprotection against sunlight, however, is making people suffer from vitamin D deficiency. Huge masks and broad brimmed cap have been the symbol of middle aged women here, who try to avoid sunlight as much as they can while taking a walk for exercise. Ultraviolet rays are harmful, of course, but the people here seem to have gone too far in protection against sunlight. An analysis showed that Koreans are increasingly suffering from vitamin D deficiency, mostly due to their lack of exposure to the sun. According to data by the Health Insurance Review and Assessment Service (HIRAS), around 16,000 people were treated for vitamin D deficiency last year, marking an average 81.7 percent increase each year since 2007 when around 1,800 people were treated. Around 2.1 billion won was spent on treatment last year, up 644.1 percent from 280 million won in 2007. By gender, there were 4,140 men treated last year compared to 613 in 2007. In the case of women, the figure stood at 12,490 last year, up 939.1 percent from 1,202 in 2007. “The annual growth is steep among women,” HIRAS noted in the report. A deficiency of vitamin D hampers growth or leads to bone deformities, known as rickets or osteomalacia. The vitamin determines the metabolism of calcium and phosphorous. When there isn’t enough of it, the calcium and phosphorous fail to accumulate in the bones, weakening them as a consequence. The bones can bend as they lack strength, and can easily break due to a fall in bone density. One can get vitamin D through food, supplements, or breast milk, but exposure to sunlight leads to the synthesis of most vitamin D. The report attributed the rising number of patients to the lack of exposure to sunlight. “The vitamin D deficiency is increasing recently as people from all age groups have notably decreased their outdoor activities during daytime, due to studies or work. In the case of females, the overuse of sun block which screens their skin from sunlight is also estimated to have made them suffer the deficiency,” HIRAS said. To prevent a deficiency, one should try to maintain an adequate level of vitamin D in daily life. The service said that exposing oneself to the sun after lunch helps a lot. “Especially in winter, people tend to focus on indoor activities as they refrain from going out due to the cold weather. However, one should keep in mind that absorption of vitamin D through diet has limitations. Taking supplements that contain vitamin D will also help,” the service said. However, overexposure to sunlight isn’t recommended, it warned. It added that breast feeding mothers should take special heed to get enough vitamin D as a deficiency will lead to a deficiency in their baby as well.